A 44-year old Kandyan Sinhalese widow of aristocratic “Radala” lineage gained global fame for her country in 1960 when she became the world’s first woman prime minister. She was none other than Sirimavo Bandaranaike who was sworn in as prime minister of Sri Lanka known then as Ceylon on July 21st 1960. It is said that the British press had to coin a new description “Stateswoman” instead of the usual statesman after she assumed office. The next woman prime minister was Indira Gandhi who became premier of India on January 24th 1966. Israel’s Golda Meir became the world’s third female prime minister when she took her oaths on March 17th 1969. This article is to commemorate the birth centenary of Sirima Bandaranaike which is to be celebrated next week. Apart from being the first female premier Sirimavo Bandaranaike has also been her country’s longest serving prime minister. Her first term was from 1960 to 1965. Her second prime ministerial term was from 1970 to 1977. During these terms of office Sirimavo was head of the govt and effectively ruled the country as the executive presidential system had not been introduced then. In later years she functioned as PM under an executive presidency from 1994 to 2000. Altogether she served as PM for a total of 18 years. No other has been premier for so many years in Sri Lanka.In addition to being prime minister, Sirimavo also called Sirima has been leader of the opposition during 1965-70 and 1989-1994. Another record of sorts was the political role played by her family and the posts they held. The Bandaranaikes were regarded as Ceylon/Sri Lanka’s foremost political family for nearly fifty years.Her husband Solomon West Ridgeway Dias Bandaranaike was leader of opposition from 1952 to 1956 and prime minister from 1956 to 1959. Her daughter Chandrika Kumaratunga served as prime minister from Aug to Nov 1994 and later as president from Nov 1994 to Nov 2005. 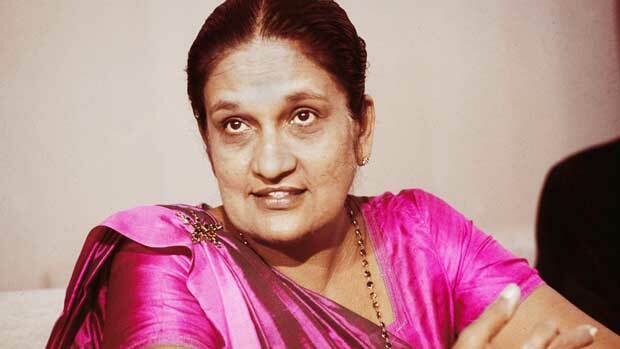 Her only son Anura Bandaranaike was leader of the opposition from 1983 to 1989. No other family in the world has such a record to lay claim to fame.It is also noteworthy that Sirima served as prime minister from 1994 to 2000 while her daughter was executive president. The world’s first woman prime minister passed away at the age of 84 on October 10th 2000 after suffering a heart attack.She had been a dominant matriarchal figure in the island’s political landscape for more than 40 years. The life and times of Sirima Bandaranaike and her entry into politics is a unique Sri Lankan story. Sri Lanka has been the South Asian forerunner in dynastic politics. The first prime minister DS Senanayake was succeeded by his son Dudley and later the nephew Sir John. In 1956 Sir John Kotelawala was defeated at the hustings by Solomon West Ridgeway Dias Bandaranaike (SWRDB). Prime Minister Bandaranaike was assassinated in 1959 but his widow Sirima became Prime minister the next year. It could be seen therefore that the Senanayakes and Bandaranaikes practised dynastic politics before other countries in the region such as India,Pakistan or Bangladesh (which came into being in 1971). Sirimavo was born on 17 April 1916 at Pussaliyadda Walauwwa, Mahawelatanna in Balangoda as the eldest daughter of Barnes Ratwatte Dissawe and Rosalind Hilda Mahawelatanna Kumarihamy. She was the eldest of six children, two girls and four boys. Shortly after she was born, a rare event occurred. A herd of elephants forcefully entered the kraal or enclosure. It was perceived as a good omen. A well-known astrologer, Hetuwa Gurunanse, was summoned to chart her horoscope. The parents were flabbergasted to hear that their daughter would be the future queen of the country. For one thing Ceylon as Sri Lanka was known was then a British colony and George the Fifth was the king. Also, women were not given leadership positions then. The horoscope however proved right and the girl did become queen, but an uncrowned one. Sirima was educated at Colombo’s St. Bridget’s Convent. She married Solomon W.R.D. Bandaranaike from a leading Low- Country Sinhala aristocratic family in 1940. He was the son of Sir Solomon Dias Bandaranaike, the Mahamudaliyar of Horagolla Walauwwe, Attanagalle. The marriage was hailed as a union between two patrician Low-Country and Up -Country families then. Solomon and Sirima had three children.The two daughters Sunethra and Chandrika were born in 1943 and 1945 respectively. The son Anura was born in 1949.He passed away in 2008. Sirima was content to be a housewife and mother of three children for 20 years while her husband went on to win political laurels as minister, opposition leader and then prime minister. She had exposure to many political leaders, visiting dignitaries and foreign diplomats during this time, when she played the hospitable, charming hostess.Sirima was also involved with the work of the SLFP Mahila Samithiya then. SWRD himself never encouraged Sirima to be involved in politics. An apocryphal anecdote that was often related in those times was illustrative of this. Apparently SWRD, Philip Gunewardena and a few other senior Govt ministers were discussing the envisaged Paddy Lands Act in 1958 .The Act provided greater rights and concessions to the long-suffering tenant cultivators.There was however a large segment of semi-feudal, land-owning class supportive of the SLFP that resented the Paddy Lands Act . This discontent was reflected in the case of Sirima too. She surprised the gathering by participating in the conversation on the subject. According to the tale When Sirima started berating Philip, her enraged husband shouted at her to stop saying “Sirima kussiya, kussiya” (Sirima, kitchen, kitchen). It was after the assassination of her husband by a Buddhist monk, Talduwe Somarama Thera, in September 1959 that a reluctant Sirima was propelled to the political centre stage. The Sinhala Buddhist nationalist party, the Sri Lanka Freedom Party (SLFP), founded by her husband, found itself leaderless and party seniors prevailed upon her to take over.But she did not agree immediately. Subsequent events, however, led to a situation where she had to relent and take over the reins to preserve her late husband’s political legacy. Party leadership and prime ministerial office was not something she sought or desired, but both trappings were thrust upon her. S.W.R.D. Bandaranaike was shot by Talduwe Somarama Thera on 25 September 1959. He passed away on 26 September. The then Education Minister Wijayananda Dahanayake was sworn in by then Governor-General Sir Oliver Goonetilleke and became the fifth prime minister of the country.Daha, as Dahanayake was known, was a maverick. Dahanayake’s brief tenure as PM was a disaster. He did not enjoy the confidence of his Cabinet. Likewise Daha did not trust his ministers whose lives were also remarkably short in that Govt. Under these circumstances the image of the party and the Government was rapidly eroding in public perception. Everything was shaky and party leaders and prominent supporters were deeply distressed about the future of the party leadership. They appealed to the grieving widow to enter politics and save the party. But Sirima Bandaranaike adamantly refused. Since a by-election had to be held for Attanagalle constituency rendered vacant due to the Horagolla laird’s demise, the party leaders wanted Ms.Bandaranaike to contest. But she refused. After much persuasion she relented, but on the condition that she would file nomination as an Independent and not as a SLFP candidate. She had been sorely troubled by tales of inner-party intrigues in her husband’s assassination and was reluctant to be identified with the party at that time.The expected by-election never took place because Prime Minister Dahanayake dissolved Parliament on 5 December 1959. After dissolution Dahanayake remained head of a caretaker Government. Until Dahanayake’s advent, parliamentary polls had been held in stages on different days. To his credit, Dahanayake ensured that island-wide elections would be held on a single day. A general election was announced on 4 January 1960. It was to be held on 19 March. The new Parliament would elect 151 members from 145 electorates with Colombo Central, Colombo South, Akurana, Batticaloa and Muttur being multi-member constituencies. Six MPs would be appointed.The announcement of an election transformed the political climate. SLFP big-wigs were rattled. The mood in the country was against the ruling party and the Government. The chief opposition United National party (UNP) stock was rising after the political re-entry of Dudley Senanayake. Prime Minister Dahanayake, instead of sticking to the SLFP, embarked on a political project of forming his own political party – the Lanka Prajathanthra Pakshaya (LPP). Other party stalwarts like S.D. Bandaranaike, I.M.R.A. Iriyagolla and K.M.P. Rajaratna also formed their own parties.The MEP was now led by Philip Gunewardena, who was also planning to form the next government by contesting in over 100 electorates.The Lanka Sama Samaja Party (LSSP) was also planning to contest over 100 seats. Its leader Dr. N.M. Perera was being referred to by supporters as the future prime minister. The SLFP with its hand symbol was virtually written off. Meanwhile retired civil servant and senior leader C.P. de Silva was doing his best to keep the party together and bring about a political renaissance. The SLFP geared itself up for elections under CP’s command. He was projected as a potential premier.As the electoral campaign got underway, it soon became apparent that despite CP’s best efforts, the SLFP was heading for definite defeat. Crowds dwindled and there was a visible lack of enthusiasm among party cadres. Without S.W.R.D., the party was like a rudderless boat. It was at this point that the pragmatic C.P. de Silva realised the urgent necessity for someone to revitalise the party and inspire the voters. Who but the tragic widow of the departed leader could do this? So CP and other SLFP leaders persuaded Sirima Bandaranaike to address election meetings. A reluctant Sirima hesitantly agreed. She started addressing public meetings.This altered the situation dramatically. The widow dressed in white began talking to the people directly and personally. She was not a powerful orator but had plenty of charisma. She spoke simply and eloquently about her “Swami Purushaya” (Lord Husband), his ideals to help the people and how he was brutally killed. Sirimavo would often break down and cry while speaking. The opposition de-cried this emotional display as a calculated act aimed at garnering sympathy. She was referred to as the “Weeping Widow” by some English newspapers. She was mocked and ridiculed. But the tide was rapidly turning.Huge crowds flocked to her meetings voluntarily. A significant feature was an unprecedentedly high turnout of women particularly in the rural areas. They empathised with her. Tears glistened in their eyes when Sirima Bandaranaike broke down. They sobbed loudly and wept uncontrollably when she cried. Despite her lack of oratorical eloquence, Mrs.Bandaranaike moved crowds. When elections were announced, the SLFP had been discounted as a winner. But as election day drew near, it was clear that the party was doing very well. When results were announced, the UNP had come first with 50 seats but the SLFP came a close second with 46 seats.The LSSP and MEP had 10 each. The LPP of Dahanayake had only four. Many smaller parties were wiped out. It was broadly acknowledged that the late entry by the “Weeping Widow” into the SLFP campaign had caused the SLFP revival. It was a hung Parliament and neither the UNP nor SLFP had an absolute majority. It soon became apparent that the newly-formed UNP Government under Senanayake did not command a parliamentary majority as most parties in the opposition were anti-UNP. The acid test was the Speaker’s election. The combined opposition candidate was T.B. Subasinghe. The UNP fielded Sir Albert Peiris. The opposition candidate with 93 votes defeated the Government candidate, who had 60 votes. The Speaker’s election was followed by the Throne Speech on 22 April 1960. The Government was defeated again by 86 votes to 61 with eight abstentions. Senanayake advised the then Governor-General Sir Oliver Goonetilleka to dissolve Parliament and call fresh elections in July. The lifespan of the UNP Government had been only 33 days. Instead of providing CP de Silva an opportunity to form an alternative Govt, Sir Oliver ‘did the dirty’ by formally dissolving Parliament on 23 April. Fresh elections were announced for 19 July 1960. With fresh polls looming ahead, C.P. de Silva felt it was time for a change in party leadership. Realising the vote-winning capacity of Sirima Bandaranaike, CP launched an ‘offensive’ aimed at compelling her to take over the party.Among those who were associated in these efforts were A.P. Jayasuriya, Badiuddhin Mahmud and D.A. Rajapaksa (Mahinda Rajapaksa’s father). After much persuasion, Bandaranaike agreed to be party leader and spearhead the electoral campaign.Her husband’s pocket borough Attanagalle had been demarcated into two seats in 1960. Bandaranaike’s cousin J.P. Obeyesekera had contested Attanagalle and nephew Felix Dias Bandaranaike the newly-created Dompe electorate. Though she could have contested either electorate and romped home the winner, she opted not to do so. The main reason was that she wanted to devote all her time and energy to the campaign trail, canvassing votes for party candidates instead of focusing on her own election. As the campaign unfolded it became obvious that Sirima Bandaranaike had made the correct decision. The campaign theme was the focus on S.W.R.D. Bandaranaike’s martyrdom. The point was driven home that he had ushered in the social revolution of 1956 that gave the common man a place in the sun. It was pointed out that the mission was incomplete.The ‘Weeping Widow’ now appealed emotionally to the electorate to vote for her party so that she could accomplish her husband’s unfinished task by forming a people’s government. Mrs.Bandaranaike was projected as the future prime minister.The appeal resonated well with the masses. The campaign succeeded to the extent where the people saw Sirima Bandaranaike as a continuation and extension of her husband’s progressive policies. She was perceived as the sole instrument through which the 1956 revolution could achieve its avowed objective and establish an ‘Apey Aanduwe’ or ‘our government’ in every sense of the term. With Sirima Bandaranaike at the helm, the SLFP experienced a renaissance. Many attempts were made by the UNP to counter this pro-Sirima wave. The UNP shamelessly used the gender card. It was propagated that a woman was incapable of governing and that a woman’s place was at home. It was said that she should look after her fatherless children instead of entering the unfamiliar area of governance. There were also crude, vulgar attacks like the one by Ranasinghe Premadasa, who said the PM’s seat in Parliament had to be purified once a month, implying menstrual periods. The last laugh was, however, Sirimavo Bandaranaike’s when the results were announced. The SLFP won 75 seats. The UNP had only 30. With the six appointed MPs, the SLFP had 81 out of 157 seats with a slender majority of five. Bandaranaike drove triumphantly to Queen’s House for her tryst with destiny. Large crowds lined up along the streets of Colombo to cheer the smiling lady as she was driven from Tintagel at Rosemead place to Queen’s House in Fort and then to Temple Trees in Kollupitiya. When she was sworn in as Premier, Bandaranaike was neither a Member of Parliament nor Senate. She was required by the Constitution to be a member of the Lower or Upper House within four months or forfeit the PM’s post. Everyone expected J.P. Obeyesekera to resign and for her to contest the ensuing by-election and enter Parliament. She surprised all by becoming a Senator and thereafter functioned as premier from the Upper House.In 1965, 1970 and 1977 Sirima contested from Attanagala and won. When the relatively young and inexperienced Sirimavo led her party to victory at the polls and went on to become prime minister, the precedent was established for two major developments. On a regional level, it was effectively demonstrated that dynastic politics had come to stay in South Asia. At a global level, Bandaranaike pioneered the arrival of women as heads of state. In Sri Lanka Sirima was referred to as “Mrs. Bee” or “Madam Bandaranaike” in English, “Mathini” in Sinhala and “Ammaiyaar” in Tamil. Sirima Bandaranaike was quite unfamiliar with matters of foreign policy when she first became Prime Minister in 1960. She mastered statecraft and the nuances of international politics while in office. Mingling with great leaders such as Jawaharlal Nehru, Gamal Abdel Nasser, Kwame Nkrumah, Josef Tito, and “Bung” Sukarno, she made a name for herself. Like her husband she faithfully adhered to the principle of non-alignment as the cornerstone of her foreign policy. Her crowning achievement came when she was selected unofficial head of the developing world at the fifth Non-aligned Summit of 1976, held in Colombo. On a practical level, the success of her foreign policy was realised when the Marxist-Leninist-oriented Janatha Vimukthi Peramuna (JVP) launched an armed revolt against her government in April 1971. Most nations, including the United States, the Union of Soviet Socialist Republics, China, Britain, France, India and Pakistan, rallied to her aid and provided assistance of different types. It was a rare instance, at the height of the Cold War, of countries divided among themselves bonding in common cause to help a “friend”. In a gesture of benign intervention, India deployed aircraft and personnel as part of indirect logistical support. Despite having been the recipient of Indian assistance, Bandaranaike did not hesitate to afford re-fuelling facilities to Pakistan in Colombo, when the Bangladesh war of liberation broke out. Although an irritant to New Delhi at the time, Bandaranaike was compelled by regional realpolitik to do so then.Years later she spearheaded an anti-India campaign in 1987-88, against the Indo-Sri Lanka Accord signed by her arch political rival, J.R. Jayewardene, with Rajiv Gandhi. In spite of these developments, Bandaranaike’s worldview, as in the case of daughter Chandrika, was not anti-Indian. In fact, it is to the credit of Sirima that she was mindful of India’s interests in the region and avoided areas of friction as far as possible. She did not, for example, plunge the country into a pro-Western and anti-Indian mode as JR Jayewardene did prior to the accord. A creditable accomplishment was her resolving the contentious issue of “statelessness” of plantation workers of Indian origin living in the central highlands of the island, estimated at 975,000. The accord with her Indian counterpart, Lal Bahadur Shastri, in 1964 provided for India taking 525,000 such people, and Sri Lanka 300,000, leaving a residue of 150,000. Known as the Sirima-Shastri Pact, it was hailed as a diplomatic breakthrough. In 1974 a second accord with Prime Minister Indira Gandhi saw both countries absorbing 75,000 each of the balance. This agreement also placed the Kachchativu island under Sri Lanka’s control while ensuring certain rights for Indian fishermen. Sirima Bandaranaike was an ardent advocate of the Indian Ocean peace zone proposal, a concept welcomed by New Delhi then. She also played a tightrope-walking role as a “limited” mediator during the India-China war of 1962.The cordial relationship between India and Sri Lanka during the tenure of the Bandaranaikes was also personified by the friendship enjoyed by the family with their Indian counterparts, the Nehru-Gandhis. A much-publicised photograph of both families led to a guessing game in the 1970s. Of the figures in the photograph, Jawaharlal Nehru, Bandaranaike, Sirima and Indira Gandhi had become prime ministers. The question was who among the children – Sunethra,Rajiv, Chandrika, Sanjay and Anura - would become premiers in the future. Rajiv Gandhi in the 1980s and Chandrika Kumaratunga in the 1990s provided the answers. In the domestic sphere, Sirima adopted a socialist policy like her husband. Various private enterprises were nationalised. Ceilings were imposed on landholdings and number of houses owned. The single largest group of private newspapers was taken over. State-owned institutions were set up to control and run most industrial and commercial ventures. Estates as well as schools were nationalised. Although she came from a feudalistic landowning family, Sirima Bandaranaike did not hesitate to work against her own class interests. Personally she forfeited thousands of acres of land to the state because of her land reform policy. Her economic policies and populist measures, however, did not bear fruit but plunged the country into ruin over the years. Her association with Trotskyite and Communist parties, resulting in the coalition government of 1970, saw the country become a Republic with a new Constitution in 1972. The name of the country was changed from Ceylon to Sri Lanka. She also faced a coup attempt by senior police and defence personnel in 1962. At the height of power, Sirima was akin to a venerated figure. Sycophants would prostrate themselves before her or touch her feet reverentially. Officials would back out from her presence and address or reply her as one would to royalty in the past. Defence service chiefs would carry her luggage personally on trips. Once women from a socially inferior caste laid down their hair as a carpet for her to walk on, but she declined the offer.The situation changed when she was out of power. The ruthless manner in which her government suppressed the JVP revolt also came under criticism. After her electoral defeat in 1977, her successor, Jayewardene, set up a Presidential Commission of inquiry and it found her “guilty” of abuse of power. She was stripped of her civic rights and parliamentary membership in 1980. In spite of being a legal “non-person”, she held on to party leadership and fought a tenacious political battle. After her civic rights were restored in 1986, she contested for the Presidency in 1988 but was narrowly defeated by the UNP’s Premadasa. She functioned as the leader of the opposition from 1989 to 1994. She may very well have become the president in 1994 but for her poor health. Handicapped by diabetes and a foot ailment, she was confined to a wheelchair during her prime ministerial tenure from 1994 to 2000. However, she remained mentally alert and agile. Sirima’s handling of the Tamil national question left much to be desired. Her attempt to push Sinhala as the sole language of official administration led to a mass Satyagraha in 1961 by Tamil politicians, leading to a paralysis of government institutions in the North and the East. She responded by declaring a state of emergency and sending in the Army to break up non-violent protests. Tamil leaders were placed under house arrest. In 1966, she led a campaign against limited rights being awarded to Tamils through district councils.In the 1970s, it was her government that introduced medium-wise standardisation for university admissions, thereby depriving deserving Tamil students of tertiary education. Tamils were discriminated against in government employment as well. The 1972 Constitution aggravated ethnic tensions by discarding provisions extending protection to the minorities like section 29, affording foremost position to Buddhism and making the country a unitary state. When Tamils dissented, a large number of youth were incarcerated for long periods without trial. Arguably, the seeds of the Tamil secessionist campaign were sown during Sirima’s rule though Tamil farmers became quite prosperous because of her import substitution policies, which encouraged the raising of cash crops. Nevertheless, it is to be noted that no anti-Tamil pogroms were unleashed against Tamils during her rule. There is also no denying that Sirima Bandaranaike was an incorruptible figure. Her financial integrity has been beyond reproach. Her personal conduct too has been without blemish. After decades of service to the people whose lot she helped better, the elder stateswoman of Sri Lanka retired voluntarily from politics in 2000, to enjoy serene bliss in her twilight years.This was not to be so. Two months later on October 10th 2000 she passed away gracefully after returning home from voting at the parliamentary elections. Whatever her critics and detractors may say, there is no denying that the world’s first woman prime minister Sirima Bandaranaike proved herself to be a capable leader steering the ship of state efficiently through perilous times. A grateful nation will no doubt commemorate in grand style her birth centenary that falls on April 17th 2016.